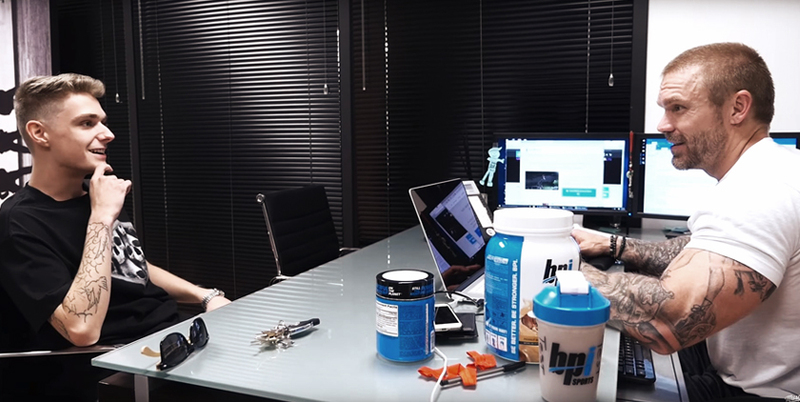 Last year, James Grage started a new weekly video series called Games to Gains. In search of someone to mentor, he found Kerby Fortner, a 135-pound gamer struggling to put on muscle and transform his physique. Over 12 weeks, James helps Kerby build a foundation of proper training techniques, nutrition, supplementation and motivation. Look out for a new blog detailing all of Kerby’s successes and struggles every Sunday and watch as he puts on his first 20 lbs. of muscle! James introduces Kerby, an 18-year-old who had been recently hired at BPI Sports to run a gaming division in the social media department. By mere coincidence, James had gotten the idea to take on someone to train around the same time. James: If I invest my time in you, I want to make sure that you first want to invest the time in yourself. Kerby: Yeah, for sure. I mean, going to the gym is something I’ve always wanted to do. It’s just, whenever I go in there, I feel like I’m misguided. Like I don’t know the specific things to do when I go there. James: I can give you the knowledge. I can answer all those questions that you have and take you from A to Z but working out is hard work. I think the people that are the most successful when it comes to achieving their fitness goals are the ones that just know how to put the work in. If you’re willing to do it, if you’re willing to step up and give me your word that you’ll stick to it, I’ll do it. Kerby: I’m really committed to doing it. And I really appreciate you taking a chance on me. People haven’t really given me a chance. I’m a young kid, so they don’t even take that second to get to know me. And it means a lot that someone’s ready to take this dive with me. Because if I’m serious, this could impact the rest of my life. Watch the full video above to see the rest of the conversation.